A few months ago, I wrote an article about game design lessons I learned from my honeymoon at DisneyWorld. In that article, I looked at some of the ways that design principles from other fields could be applied to game design. In this article, I want to go the other way, and look at how some designers have been trying to apply game design principles to real-life, also known as Gamification. These days Gamification is practically everywhere, from education to fitness, health to business. Many businesses believe that gamification is a cheap and easy way to change consumer behavior by providing them with points and achievements. However, gamification is not without it’s critics. These critics believe that gamification is misleading, because it takes only the most surface elements of games in order to trick consumers. In this article, I want to take a close look at gamification. First, I will go more in-depth into exactly what gamification is, and how it is used currently. Next, I will look at why gamification is used, and some of the criticisms of the current system. Finally, I’ll present some of my ideas on how this system could be improved. Lets start with a simple question – what does it mean to “Gamify” something? Games come in a massive variety of shapes and sizes, with almost infinite combinations of different mechanics to choose from. That being said, these days gamification generally refers to one thing – a rewards system. The simplest and most common form of gamification simply boils down to a system of points and achievements that users can gain over time by doing some task. The thought behind this method is that earning points and achievements will give “players” a sense of accomplishment, and make doing the task feel like playing a game. In many cases, these techniques are actually used with good intentions. For example, for about a year I used an app called “Plant Nanny”, which I used to keep track of how much water I drank. In this app, you would set a daily goal for how much water to drink, and record the amount you drank as you went. As you drank, the app would water a plant in the app, and over time it would grow. When you grew a plant to full size, you would get some seeds which you could use to get and grow new types of plants. For me, Plant Nanny is proof that, when done right, this type of gamification can actually be a good thing. The app was simple, unobtrusive, and yet very effective – I actually did end up drinking more water, and it became a habit that I continue to this day. In certain applications, such as health, exercise, and education, simple gamified programs such as this can be useful tools for promoting positive behavioral change. However, not all gamified programs use it for such noble ends, and most are not so well designed. Plan Nanny, in my eyes, does a lot of things right. Firstly, there is a very clear connection between what you do in real life and what happens in the game – you drink water, the plant gets water. Secondly, it actually gets you invested in the endeavor – instead of simply watching a progress bar fill up, you are actually watching an adorable plant grow. Over time you become attached to that little plant, and you actually want to take care of it. 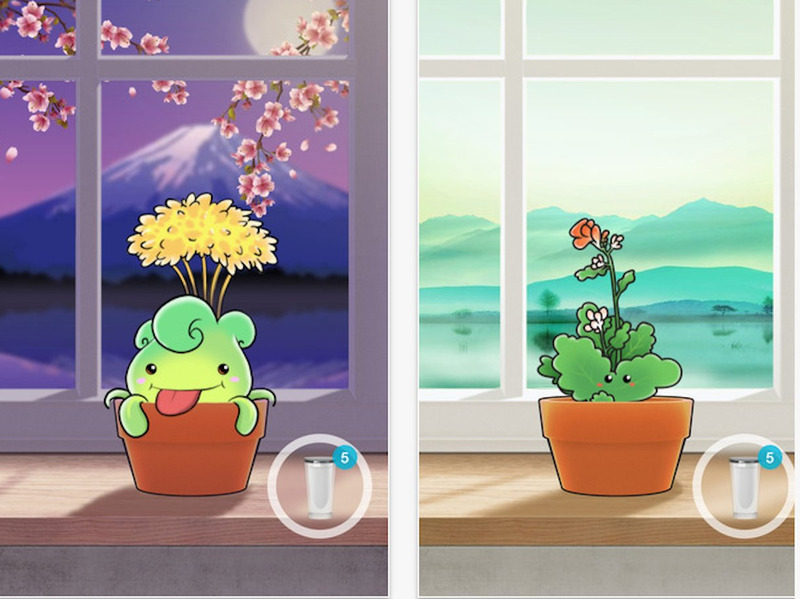 Finally, unlike many gamification programs there are actually consequences in Plant Nanny – if you don’t keep up with your water goals, the little plant will slowly shrivel and eventually die. Unfortunately, most gamified apps and systems are not this well designed. Instead of being a single, well unified system, in many cases the elements of points and achievements is simply pasted on top. However, if you are trying to encourage positive change, badly designed gamification can still be better than none at all. The best uses of gamification are when it is used to give users a little extra motivation to do something that they already want to do, like work out more or learn a new language. Although there are some cases where gamification can be used to improve people’s lives, it is definitely not without it’s criticisms. One of the biggest criticisms of gamification is that it is misnamed, and has almost nothing to do with games. In many cases, the only aspect of games that are actually used is the reward system, which is presented as the entire game experience. While this type of points system may have it’s place, it is not necessarily fitting with the name “gamification”. In this article, author Margaret Robertson suggests the term “pointsification” instead. The debate about gamification goes much deeper than the name, however. While gamification can give people the motivation to complete tasks they already wanted to do, it can also be a tool that companies use to influence consumer behavior. One example of this is the (now defunct) My Coke Rewards program. This program allowed users to enter codes found on Coca-cola products to earn virtual points, which could then be spent on “prizes” (usually more coke products). This program grew to become the world’s largest corporate rewards program, before it was replaced earlier this year with a new “Sip&Scan” system. Boy do I love playing games! The My Coke Rewards system is a great example of how gamification can be used to encourage unhealthy behavior, just as much as it can healthy behavior. Throughout it’s life, My Coke Rewards was criticized by numerous groups, mainly for promoting unhealthy behavior (particularly for children and young adults). Despite this, the system was incredibly popular, and was only replaced due it’s use of outdated technology. While it’s true that gamification can be used to encourage unhealthy behavior, I don’t think that this necessarily makes it bad. Gamification is simply a tool, and like any tool it is only as good or bad as what you do with it. Eagle-eyed readers might notice something about this list of “game mechanics”. With the exception of perhaps leveling up and points, none of the things listed are game mechanics. Some of them even have very little to do with games! For example, raise your hand if you consider “Onboarding” to be a game mechanic. The biggest problem with gamification as it currently stands is that most often it is put into practice by people who seem to know very little about games (you know, the kind of people who consider one of the ten most important game mechanics to be “badges”). Because of this, as we have shown, gamification has almost nothing to do with actual games. The idea of using aspects of games to motivate people is not a bad one, but it would be a lot more effective if it actually tried to live up to that, instead of simply slapping a point system on top and calling it a day. In fact, I believe that the system that is most effective at using game elements to motivate a change in behavior was not a “gamified” app at all, but Pokemon Go. While I believe that Pokemon Go has a lot of problems (some of which I wrote about here), one thing cannot be denied – it got a lot of people walking! Pokemon Go did what no other app has managed to do – it got millions of users to start walking more, and actually made it fun (for a time). The reason for this is simple – it was designed, from the ground up, as a game. Although Pokemon Go resulted in a lot of walking, the walking was not itself the goal. Instead, the walking was a prerequisite to achieving the actual goal – catchin’ ’em all. That is the big difference between “gamification” and designing a game – in the first one, your goal is to get somebody to do something, while in the latter the goal is to be fun. I think that gamification could be much improved if it started with the goal of making the action as fun as possible, and worked from there. Instead of simply rewarding users for doing what you want them to do, give them something that they actually want – a game. Let’s suppose, for example, that you own a chain of gyms and want to create an app to encourage players to come in to the gym more often. The end goal is to increase the frequency and amount of time that they spend at your gyms. After establishing this goal, the next step is to figure out a way to make going to your gyms a fun and rewarding activity. The activity that you are trying to encourage should correlate with what happens in the game itself. What could we possibly do in-game that correlates with the action of working out at a gym? Well, when you work out you are trying to make yourself stronger and healthier. Therefore, I think a good correlation would be if somehow the act of working out at the gym was able to improve the stats of your character inside the game. Over time, you could see your character grow and level up as you workout more, gaining new skills and abilities. In addition, the game could be designed that the player can actually go backwards after not going to the gym for a certain amount of time. This mechanic would form the main “hook” of the game. After deciding on this hook, we have a few questions. Firstly, we know that our character will grow over time as we attend the gym, but how will this actually be implemented? Secondly, what do we actually do with this character? For the first point we have a couple of different options. One solution that jumps to mind is to tie the rewards to the location either through a GPS system, or through inputting codes that can only be found at the Gym location. This would do the job of encouraging people to go to the gym, but might not necessarily encourage them to workout. In order to get that part, you could have a system in which character upgrades are connected to your actual workout – running boosts your character’s speed and endurance, for example, while bench-pressing can increase strength. Now that we have figured out how to reward the player, we need to make those rewards a prerequisite to the goal of the game, not the goal itself. Basically, we need to figure out a way to put all of those hard-earned stats to good use! For this, we have lots of options, but one that fits quite well is the RPG. Your character could start out weak, and as you go along the enemies and challenges would get more and more difficult. In order to move forward you would have to improve your character, and that means grinding – not in the game, but at the gym. I know that my example above is quite rough, but even so I believe that it shows what is possible with gamification. I believe that the system above would be far more effective than simply giving the user points every time they walk into the gym, both for the user and the company. That is all I have for this week! I hope you enjoyed this article about gamification! If you did, check out the rest of the blog and subscribe on Facebook, Twitter, or here on WordPress so you will always know when I post a new article. If you didn’t, let me know what I can do better in the comments down below. And join me next week, where I will be talking all about the game design lessons of everyone’s favorite Italian plumber (besides Luigi)!